I cannot believe school has started, the weather has gotten cooler and it is almost Halloween. My kids LOVE Halloween and we make a big production out of it every year. We have one really big neighborhood we have been going to for years that gives out full sized Snickers bars! The kids really love to dress up and get into the spirit of things and it is always so much fun deciding on a costume to wear. By the time my husband gets home from work and we get the kids suited up, it is all we can do to contain the kids from exploding before we can get out and trick or treat. 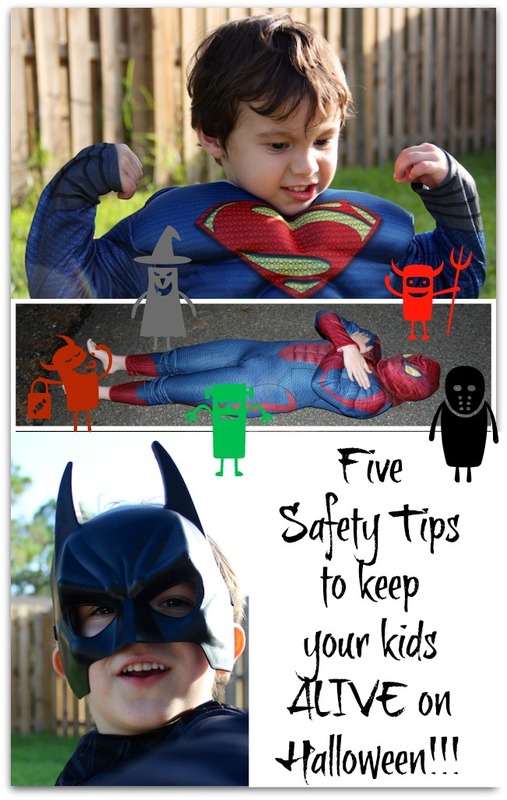 Costumes: Be sure you choose costumes that are easy for the kids to move around in safely. Make sure the length is not too long, the outfit is not too tight and if a mask is worn, the kids can see well. Location: Choose an area you are familiar with, is well lit and has plenty of people that are out in groups. Choose a location with sidewalks so the kids are not walking in the street or drive from house to house if that is an option. A popular alternative fro going house to house is the trunk-or-treat gatherings many churches, community centers and businesses offer for kids to go to one small location and go fro car to car. Pumpkins: If you like to decorate or carve a pumpkin, you are one of millions who share your passion. Be sure to supervise children and purchase safety tools for carving. Do not leave smaller children to carve alone or with a knife or other sharp object. Groups: Do not allow children to go out alone, regardless of their age. Be sure kids are in large groups and a chaperone is present. If the kids are older, it is still a good idea to have an adult keeping an eye on everyone. Lights: Make sure the area you are visiting is well lit. Even with lighting, be sure the kids are equipped with a device that will give them illumination, preferably on their person. We prefer the items from Nite Ize for our safety lighting needs. Nite Ize is a seasoned company that has been in business for over 23 years and is still going strong. The idea for the company was to bring innovation and creativity together for their line of problem/solution based products. This is a company that cares as deeply about their customers and their satisfaction as they do their team members and our planet. The idea for Nite Ize came to founder Rick Case when he was fishing at night. Rick tried to use the mini flashlight he had brought and was holding it in his mouth while trying to fish. This is when the idea for the Headband Mini Flashlight Holder, his first product came to be. Now fast forward 20 years and Rick has built a company that provides its customers with the finest quality products to make their life easier and help you with keeping your family safe. I was sent a variety of products from Nite Ize and the kids could not wait to try them out. It was really funny watching them as they traded with each other until they decided on their favorites. For Henry, he likes the SlapLit LED wrist band ($11.99) as well as the Marker Band ($11.99) which he was able to fashion as a belt around his little waist. Caitlin grabbed the Helmet Marker ($11.99) and the Curvyman ($3.39), which keeps her earbud cords from getting tangled. I also told her to use the Connect Case for her iPhone so she can just clip it to her jeans, making it easier to keep up with her phone. Chris works nights, so I gave him the SpotLit LED light for his key chain ($7.19). We just love our Nite Ize products and I would highly recommend these functional, useful and very affordable products which can be purchased from their website. We make sure the kids have some kind of light when they go out. We do not have street lights and it can be very dark here.